Garvey's Choice by Nikki Grimes I give this book 3 hearts because it wasn't the best but it wasn't too bad the main reason though was because it didn't tell much of a story since it was mostly like short descriptions or chunks of days and people. Thanks for your review, Maritza! This novel in verse is great for poetry lovers. Happy Valentines Day. The book I had was "the boy on the wooden box" by, Leon Leyson. I would give this book 3 stars because It was decent, but for some reason it didnt make me want to keep reading on. It got a little boring, and I quickly lost interest. Though it was dull in my opinion I would recommend it to someone else who might find it quite interesting. Sorry The Boy on the Wooden Box, wasn't your'dream date'. This is a true story from an actual Holocaust survivor. Thanks for reviewing. Happy Valentines Day! The book i read was called "called in the sun" by Lisa Graff. I would rate this book 5 because i just want to keep reading it.At one point i did not want to put it down because of the stuff that was happening. I did end out finishing the book because it was full of exciting conflicts. I would recommend this book to somebody else because it was great. I loved it so much because the characters. 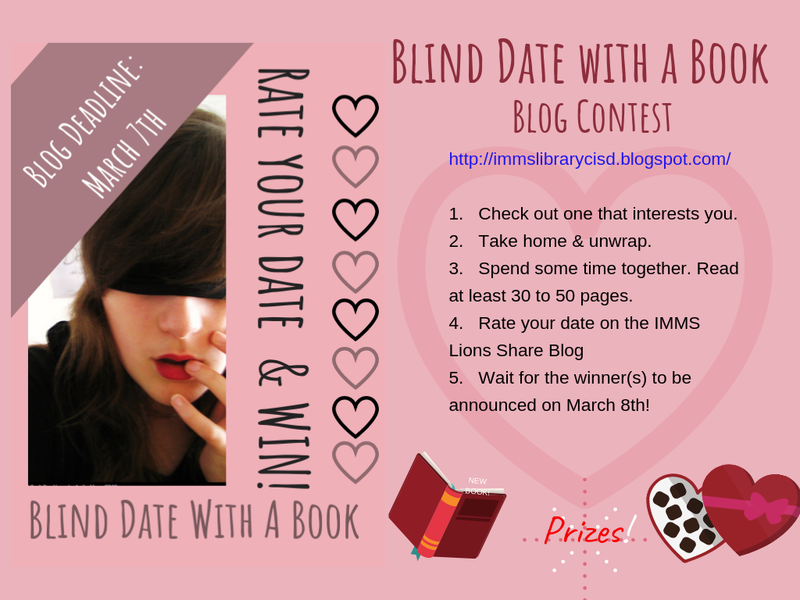 I loved this book and was excited to add it to our 'blind date' books. I can't imagine all that Trent had to go through. . . Thanks for reviewing and I hope you like the end. Happy Valentines Day. Yep, Kristi doesn't think much of the Germans. Thanks for trying something new and reviewing this book by Lois Lowery. Happy Valentines Day! BLIND DATE WITH A BOOK CYNTHIA P.
I would rate this book a 5 star! I'd rate it this way because it is a very creative book. I really liked this book because it stood out how Jackson, the son, or the main character of the story, had an imaginary friend that was a giant cat. This book was a really good one and I would always read it again! My favorite part of the book was when they had to move houses and live in their van because the boy, Jackson, was so supportive to his sister, Robin, and his parents. He is so confident in himself like the part in the book where he said he knows that they were having trouble with money but he still had a positive attitude. The book shows a lot of emotions. I absolutely loved this book because of so many reasons. Thanks for your great review Cynthia! I love how you included your favorite part of the book. Crenshaw is written by the same lady who wrote The One and Only Ivan, so you know its good. Happy Valentines Day! I am reading unwind by meal Sherman. I would give this book 4 stars because I like it a lot but it's not perfect. Thanks for your review Estefanie! my name is itiel r and I read the book named WHEN it is about when can see the future the can tell when people are born and when she eating pizza she saw her friend and met here and remembered her. I'm reading Endling the last BY KATHERINE APPLEGATE. This book is amazing it starts off with a wolf pack ,and they are free and wild. But then the Darines come and take over there land.the sad part is that the wolf die from the Darines . Do you want to know who the Darines are or what there like well they are...............to bad you can't know ,your just going to have to read it yourself to find out. have fun reading this book well at least until I'm done with it. My name is Ana Fuentes Ruiz and my book is Wolves of the Beyond lone Wolf By Kathryn Lasky I will give it a 4 hearts because it was Awesome book but at the same time it was not but I still like the book and everything. The book starts off very flatly and you must be patient with the kick off. The first chapter is a exploration of out to main characters. Drue and Benny. Benny is from the Drylands where food, water, and other recourses are scarce. Drue is a wealthy kid who has everything he wants and is only full of himself. But as you read you see he's just trying to prove himself. The whole story is built around the fact that they are scholarship winners to go to the moon. Where a resort was built. And one lucky winner from all 101 kids there will get to stay. But everyone goes home with some money. You have to read to find out why everyone's there. Its really is worth it. Nice review, Angelina. I'm glad you liked this book. Jeramey Kraatz is an excellent author, and I believe he lives in Fort Worth. He'll be at the North Texas Teen Book Festival this year if you'd like to meet him in person. Not enough, Zach. . . The book that I am reading is Wish You Were Italian and to be honest this book gets 5 hearts. And in the beginning it doesn't really grab your attention but after some time it grabs your attention and makes you want to read more just to see what happens. So about the book the main character is Pippa and she goes to Italy by herself since her parents sent her there for the summer. And she meets a boy named Darren and he takes her to see some of the sights in Italy. But at first she is skeptical because she just met the guy but they hit it off. But she realizes that she might never see him again so she..... sike you thought I was going to continue but you are just going to have to read the book yourself and see what happens. Great review, Natalie! I liked this book too. Fun, simple and romantic! my book is minecraft the island and i rate this 5 because when i unwrapped it and when i saw it i loved it since it was minecraft and i love minecraft so i got really excited and when i started reading it i love how the author putted it in first person of point and view i especially loved the part when he woke up in the middle of the ocean thinking what happened or where was he i also loved chapter 1 cause it demonstrated to never give up even do he was all confused and thought it was a dream he never gave up and tried to survive.My favorite part was when he tried to plant seeds to grow plants but he wasn't really good at it cause he was trying to figure it out also because since he was so hungry he found a tree and he asked himself if people ate bark!!!! but either way he couldn't since his hands were rectangular shaped.If you like minecraft,gaming or adventure this book is definitively for you or even if you want to try something new. the book was by max brooks who wrote world war z. Excellent review, Lyalorde. I'm glad it was a "match" for you. Thanks for participating!